Bendis takes the tragedy of Spider-Man’s origin head on. A wife sits on the couch that she and her husband played cards on only a few hours before. She recounts the events of the evening to a police officer. An unfamiliar sound from the kitchen alarms them both. Is it their nephew, they wonder? He’s been gone for hours after another uncharacteristic outburst. It is, in fact, an intruder. The husband attempts to calm the young man but things go bad. The husband is shot dead in front of his wife’s eyes. Writer Brian Michael Bendis revisits the origin of Spider-Man in the opening volume of “Ultimate Spider-Man” and, using hindsight to his benefit, focuses firmly on the dramatic elements of the story to gut-wrenching effect. Ben Parker did surprise an intruder in the original “Amazing Fantasy” #15, but this all occurs off camera and is told to Ben’s nephew Peter by a police officer outside the Parker home in Queens. By telling the story from May’s point of view, with her husband’s blood splattered across her blouse, Bendis mines the tragic context from the story without altering the familiar beats. Bendis, with co-plotter Bill Jemas, has taken the source material (mainly from 1962’s “Amazing Fantasy” #15) to retell the origin over a five-chapter story arc. With the expanded space, Bendis includes more characters important to the Spider-Man mythos in this opening arc, rather than slavishly following the course of the original “Amazing Spider-Man” run. More importantly though, Bendis brings a contemporary sense to these popular characters, providing them with a three-dimensionality that wasn’t as commonplace in the original story. The tale is familiar and Bendis treats this retelling with a reverence for what has come before. From time to time “Power and Responsibility” strays from the recognizable, but always returns to the heart of what has made the these characters resonate with readers for decades. Peter Parker is a bright high-school student who, while on a field trip to Osborn Industries, is bitten by a genetically engineered spider. In between passing out repeatedly, Peter begins to experience powers that he quickly realizes must have been gained from the spider bite. While this occurs, Peter remains under the surveillance of Norman Osborn, who is concerned that Peter’s accident could cost the company millions in damages if the spider-bite turns out to be lethal. 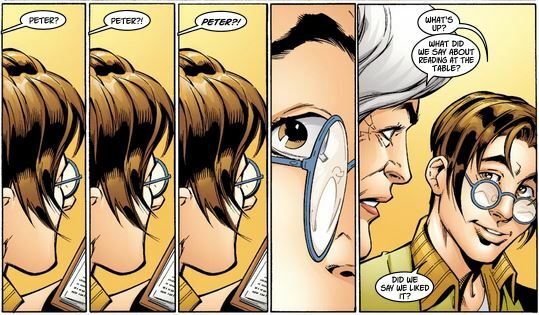 Norman Osborn’s inclusion in the Spider-Man origin is important because it establishes the ties between these two characters from the beginning. It is something that readers are aware will transform into something infinitely more contentious. And Norman is one terrible S.O.B. 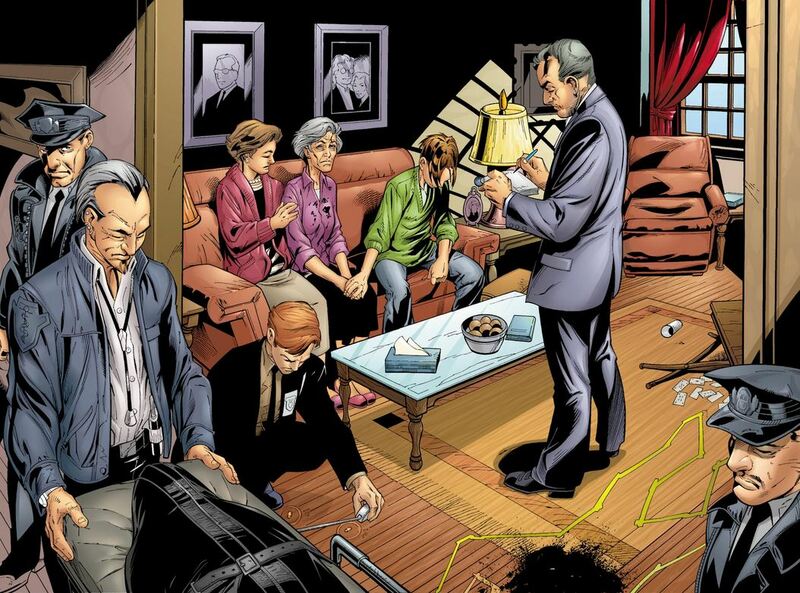 Forget that he is willing to have a fifteen-year-old boy assassinated just to protect his business interests, but Norman Osborn is indeed something worse: an awful dad. When teenage Harry Osborn comes in to speak with his father, the industrialist looks shocked that his son would dare approach him. “Martha?! Martha!,” screams Norman, “Will you get this kid out of here? !” Ordering the death of an innocent high school student to protect your interests? Unconscionable. Not acknowledging your own flesh and blood when he’s standing right in front of you? Well, that’s downright monstrous. Bendis’s dialogue adds warmth and charm to his characters. It’s Bendis’s lighthearted wit, which often manifests unexpectedly, that humanizes his characters. Peter comes downstairs to apologize to Ben and May after shouting at them and May asks “Yes, Mister Mouth?” before Peter can make a declarative statement. It’s these subtle touches that Bendis uses to fill his stories with characters that are made relatable through their snappy dialogue. One quibble with the story is with the pivotal scene in which Peter fails to stop the criminal who will eventually take his uncle’s life. In the original story, Peter flat-out chooses not to stop the thug who races past him. In this version, Peter is not aware that the criminal has committed any crime. It reduces the impact of his mistake because it isn’t as though his actions were as thoughtless as his Marvel Universe counterpart. Bendis puts Peter on a voyage of self-discovery in this opening volume. He’s using his powers to defend himself, to become a star on the high school basketball team and to raise money so that Ben and May can repay Flash’s family. But none of this feels right to Peter. It isn’t until Ben is murdered that the would-be hero finds his purpose and understands how he is supposed to use his powers. While the main action is going on we continue to return to Norman who is eager to see his company’s genetic experiments gain more steam. Forget using a spider as a middle man, the industrialist orders Doctor Octavius to use the drug on Norman but the results are disastrous. This new take on the Green Goblin varies significantly from what Marvel readers are used to, but Bendis’s story only serves to introduce the hero and villain as rivals. Norman’s transformation into a monster is addressed head-on in a two chapter second arc in this volume. Spidey leaps into action in the second arc. By the time we get to the Green Goblin showdown, Peter has only recently been fulfilling his free hours as a masked vigilante. The story briefly introduces Daily Bugle Editor-in-Chief, J. Jonah Jameson, and his star reporter, Ben Urich, as Jonah tries to figure out the quickest way to sell papers featuring this new guy swinging around, calling himself Spider-Man. In between classes, Midtown High is attacked by what appears to be a fire-spewing creature. While the choice to turn the Green Goblin into a monster is an acceptable one, Bagley’s costume design just doesn’t totally fit. It makes sense for the villain to be wearing tattered clothing, probably snatched from clotheslines and dumpsters. However, with a belt fit with some kind of gemstone and the material wrapped around his wrists, Green Goblin takes on a mystical appearance that doesn’t feel appropriate for the character. If it wasn’t clear in the opening arc, then it becomes so with the second: Mark Bagley is sensational at drawing Spider-Man. The artist gets plenty of opportunities to show off his chops in the battle between Spidey and the Goblin as the fight heads from Peter’s high school to the city. 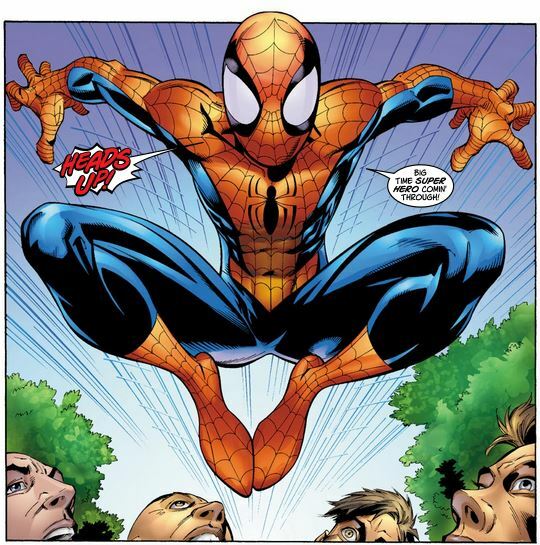 Bagley’s Spider-Man is a rubber band, stretching and jumping around the page in a more recognizable costume than the wrestling outfit he wore in the first arc. A downside to the art is that Bagley’s characters tend to have similar faces and they can sometimes be too angular. That said, the expressiveness of Bagley’s characters is key to conveying the emotional punches Bendis throws into his storytelling. Bendis plays up Spidey’s sense of humor during the battle as he cracks one memorable one-liner after the next. “Look at me being the smart-mouth when I’m scared out of my mind,” thinks Peter. “I guess it’s either that or I pee in my tights.” While Bendis’s opening arc was a strong re-envisioning of the Spider-Man origin, like Bagley, the writer proves just how suited he is working on this character in the second story. Bendis gets into Spider-Man’s head and finds an honest voice for the rookie superhero. If the only goal of “Ultimate Spider-Man: Power and Responsibility” was to present an accessible introduction to Spider-Man and his rich universe of characters, then Bendis and team are to be congratulated. “Power and Responsibility” is much more than this though. For all of the fun and action that Bendis and Bagley instill into their story, this is dramatically touching story that will linger with you long after you’ve put it down.